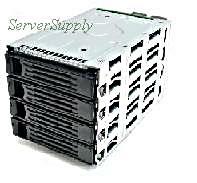 Compaq - COMPAQ PROLIANT SCSI 4X1 DRIVE CAGE PN: 387090-001 4-BAY LVD FOR PROLIANT 1850R 6400 DL380 DL580 C2500 ML350. SAME AS 159137-001. Hewlett Packard - A5675A HP/COMPAQ - 4 BAYS RACK MOUNTABLE SURESTORE DISK SYSTEM 2100 SCSI STORAGE CABINET 1U(A5675A). REFURBISHED. IN STOCK. SHIP SAME DAY. Intel - D22807-202 INTEL - 4bayS EXPANDER ENCLOSURE - STORAGE ENCLOSURE 4 X 3.5INCH - INTERNAL HOT-SWAPPABLE (D22807-202). NEW. IN STOCK. SHIP SAME DAY.